Sunday afternoon saw me en route to Kentwell Hall, the delightful Tudor house nestling to the north of Long Melford in Suffolk. The house and gardens, very much a home and not just a ‘Stately Home’ have been a favourite diversion of mine during the course of walks in the area for some time. 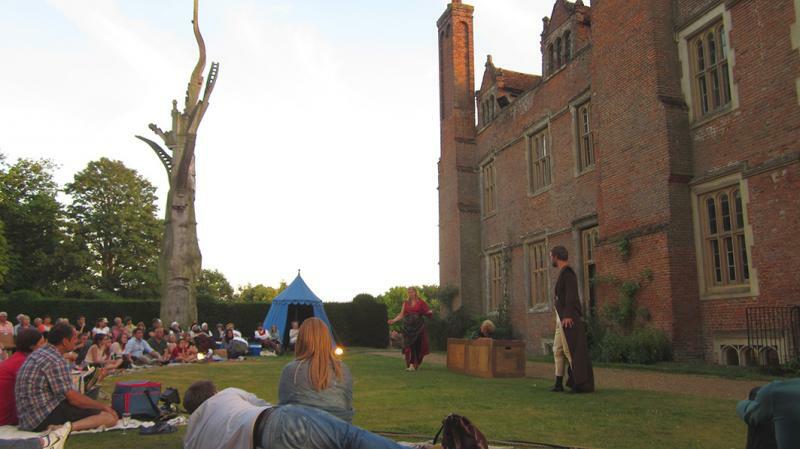 My purpose in visiting this time was not The Maze, the Ancient Yews, or the restored Icehouse but to see an open air production of my favourite Shakespeare play, A Midsummer Night’s Dream, by the GB Theatre Company. Though the forecast had threatened showers, the day held fair; much to the relief of the audience seated around the simple ground-roped auditorium and the Players too! The usual device of Theseus and Hippolyta playing both themselves and the Faerie King & Queen, Oberon and Titania worked well, thanks to the excellent Jonathan Mulquin and Rosalind Steele. Doug McRobbie made an excellent Puck, his Scots accent lending an air of quite believable mischief to the part. My favourites as always were the ‘Rude Mechanicals’ particularly Derek Howard, whose hammy Bottom (hmm that doesn’t sound quite polite does it?) stole the show, and Anil Kumar as both Flute and a reluctant Thisbe, a performance worthy of any great Panto Dame. Puck’s errors and the ensuing rifts between lovers made for great comedy theatre and the final performance of the Mechanicals in the tragi-comic sub-play Pyramus and Thisbe was hilarious. All in all a wonderful performance in superb surroundings and the magic of the play was perhaps best reflected in the faces of the many children there. Clearly captivated by, what was for many of them, their first play it bodes well for the future, which many, I think wrongly, see as children’s imaginations being dominated by computer games.